He was an actor in a very old-fashioned sense of that word — one from a world that pre-dated Marlon Brando. He had no whiff of the Actor’s Studio about him. You didn’t go to see one of his movies and come away stunned at his ability to portray a wide range of characters. He never disappeared into his character. On the contrary, every character he ever portrayed disappeared into him. This was just fine with his fans. Because they didn’t go to the movies in 1948 to be entranced by Thomas Dunson in the film Red River, any more than they did that same year to be captivated by Captain Kirby York in Fort Apache, or by Sergeant John Stryker in The Sands of Iwo Jima (1949), or by Sheriff John Chance in Rio Bravo (1959), or by J.B. Brooks in The Shootist (1976). No, John Wayne’s fans didn’t go to the movies to get lost in his character. They went to the movies to be reminded of John Wayne, the man — who he was, and what he stood for. He had no control of his voice, less control over his walk; and he threw a haymaker you could see coming before the movie started. But America adored him. It adored him because he personified the conservative values he would later defend and promote off screen. Wayne starred in so many memorable films, it would be difficult to associate him with just one. But for my money, John Ford’s The Quiet Man (1952) comes closest to what might be considered a signature role for him. The film is suffused with Irish lore and wit, not to mention Irish actors: Dublin natives Maureen O’Hara, Barry Fitzgerald, and Arthur Shields (Fitzgerald’s younger brother). Director Ford himself was a proud first generation son of parents who hailed from Ireland. John Wayne himself was of Irish, Scotch-Irish, and English ancestry. John Wayne’s fans didn’t go to the movies to get lost in his character, but to be reminded of John Wayne, the man — who he was, and what he stood for. But once you see him in The Quiet Man, you make the kind of accommodations that your imagination allows for no other John Wayne film. You grant him permission — finally — to disappear into his role. He indeed becomes Sean Thornton, an Irish-American boxer looking to leave his home in Pittsburgh to claim his family farm in Innisfree. The plot revolves around Sean Thornton and Mary Kate Danaher, the girl next door — or rather, the girl who lives on the farm next to Thornton’s. The two fall in love at first sight. But for Thornton to win her hand in marriage, he has to ask her dominating brother, Will Danaher (Victor Mclaglen), to release her dowry funds. Danaher does not want to let go that easy. Thornton is hesitant to confront Will over the dowry lest they come to blows. He’s kept it a secret that when he was a professional boxer in the States, he had killed a man in the ring. With the encouragement of the local Protestant minister (Shields), Thornton decides to risk an out-and-out brawl for the woman he loves. What follows is one of the most famous fight scenes in film history. It moves from pub to Innisfree landscape back to the pub. Suffice it to say Thornton wins the fight, and the love of his life. 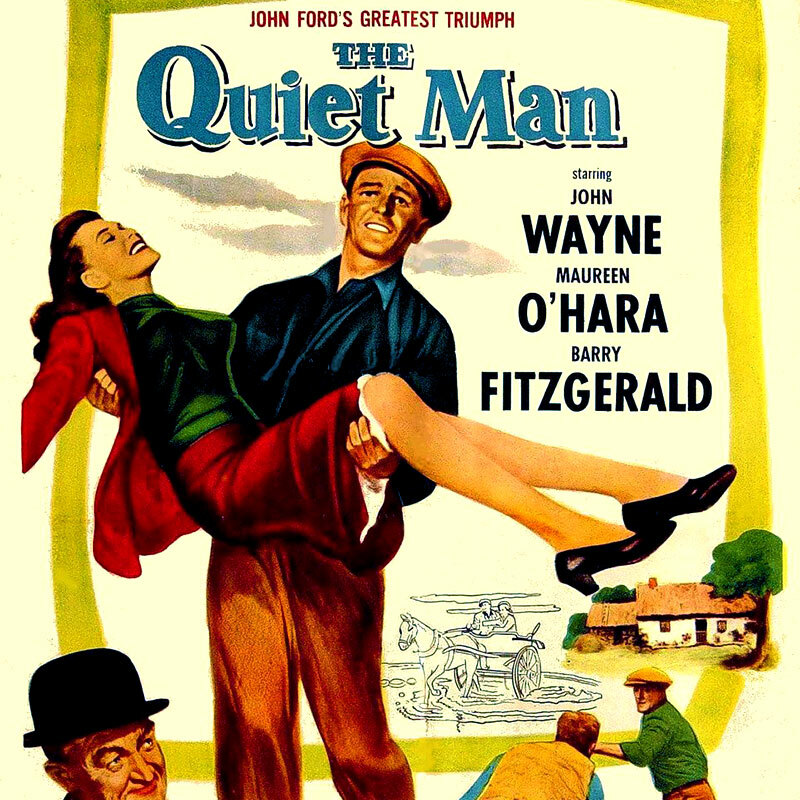 While critics were harsh on The Quiet Man for what they considered stereotyping of the Irish as drinkers and fighters, audiences loved the film. What’s more, the picture still holds up. In later years, Maureen O’Hara, who starred as John Wayne’s romantic lead in five other films, described him this way: “he was a naturally macho human being… very male, very masculine. I think God made him that way.” Clearly, this machismo is the energy a contemporary audience still feels when it watches The Quiet Man, or for that matter, most John Wayne films. It’s fitting that John Wayne should have won an Academy Award for a film with the title True Grit — as apt a description of his film persona as it was of his real-life personality. Are American Immigrants Fleeing To Germany?